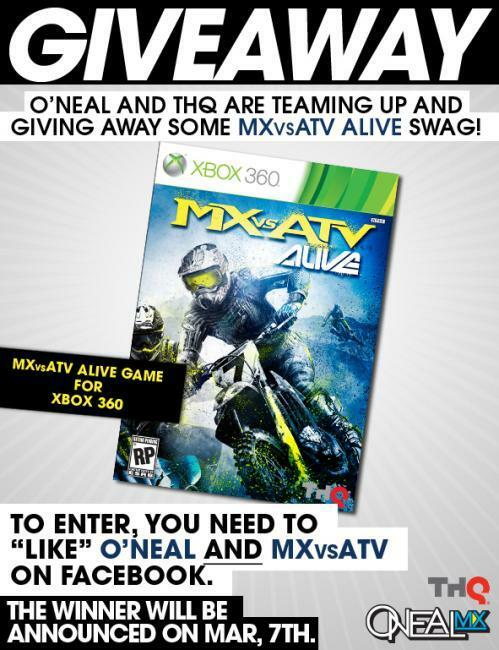 O’Neal and THQ are teaming up to give away some MX vs ATV Alive swag! To enter, visit www.facebook.com/onealmotocross and “LIKE” our page, then head over to www.facebook.com/mxvsatv and “LIKE” their page. Its that simple! A winner will be randomly selected on March 7 to receive a copy of MX vs ATV alive when the game is released in May! Good Luck!